President Tran Dai Quang and the high-ranking Vietnamese delegation attended a ceremony in Tokyo on June 1 celebrating the 45th anniversary of bilateral diplomatic ties (September 21). Present at the event were Japanese Emperor Akihito and Empress Michito, Japanese ministers and nearly 50 parliamentarians, leaders of Japanese political parties and Vietnamese nationals living in Japan. The presence of the Emperor and Empress indicated the special regard that Japan has given to the extensive strategic partnership for peace and prosperity in Asia with Vietnam. Speaking at the event, Deputy Prime Minister and Foreign Minister Pham Binh Minh said since the establishment of bilateral diplomatic ties on September 21, 1973, Vietnam and Japan have gone a long way together to foster friendship, mutual trust and respect, and equality for shared benefits. He said both countries are now not only extensive strategic partners but also sincere friends. This celebration reinforces the firm belief in the brighter future of the two countries' relations. Japan has become the top important, long-term partner and a close friend of Vietnam, evidenced by regular high-level visits and exchanges, he said, adding that the Vietnam visit by the Emperor and Empress of Japan in early 2017 left impressions on millions of Vietnamese people. The Deputy PM expressed his belief that with high political trust, efforts and supplementary strengths and potentials, Vietnam-Japan ties will enter a new development period with more effective and practical results in every field. He affirmed that the 45-year path will be extended on the back of close-knit and growing ties between the two nations. Japan's Foreign Minister Taro Kono, for his part, emphasized that the Vietnam – Japan relationship is closer than ever and the evidence for such strong bond of friendship was the State visit to Vietnam by Emperor Akihito and Empress Michiko last year and this State visit to Japan by President Tran Dai Quang and his spouse. The two sides have agreed to further strengthen and expand cooperation and exchanges in multiple fields, such as politics, security, economics, human resources training, culture and sports; and together address regional and global issues. 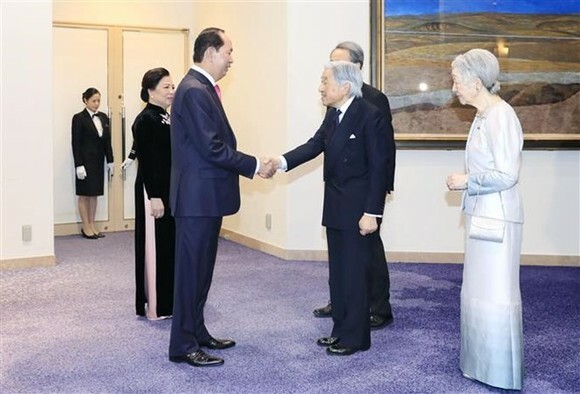 President Tran Dai Quang took this occasion to award the Order of Friendship to Japanese officials in recognition for their great contributions to the development of the two countries’ relations. They are Secretary General of the Liberal Democratic Party of Japan (LDP) and President of the Japan – Vietnam Parliamentary Friendship Alliance Toshihiro Nikai, Chairperson of the LDP’s Policy Research Council Fumio Kishida, Special Advisor and former President of the Japan – Vietnam Parliamentary Friendship Alliance Tsutomu Takebe, Special Ambassador for Japan – Vietnam and Vietnam – Japan Relationships Ryotaro Sugi, Acting Secretary General of the LDP and Acting Secretary General of the Japan – Vietnam Parliamentary Friendship Alliance Motoo Hayashi and Most Venerable Buddhist Master Yoshimizu Daichi.